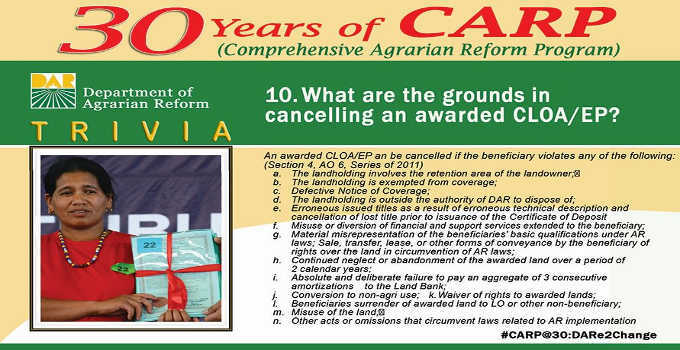 What are the grounds for CLOA Cancellation? RA 6657 otherwise known as The Comprehensive Agrarian Reform Law being implemented by the Department of Agrarian Reform (DAR). Basically, CLOA is a Title of Land issued by the DAR and must be registered at the Registry of Deeds (ROD). How to apply for CLOA Title? or arrangement with the land owner. the distribution of farm land to landless farmers. assistance from the BARC – Barangay Agrarian Reform Committee (DAR Adm. Order No.5, Series of 1989). It would take a long process of documentation and validation before the issuance of CLOA. eventually for recommendation for approval to the higher authority – Secretary of DAR. beneficiaries as mandated under the law.